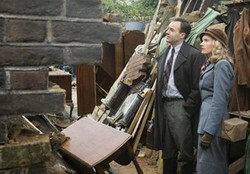 Murder on the Home Front is a two-part crime drama due to be broadcast on ITV on Thursdays the 9th and 16th May 2013. Set in wartime London against the backdrop of the Blitz, the show is based on the memoirs of Molly Lefebure, secretary to Keith Simpson, regarded as the founder of modern forensics. Tamzin Merchant stars as Molly. Based on the memoirs of Molly Lefebure, Murder on the Home Front is a two-part crime drama set in the 1940s and due to start on ITV on Thursday 9 May 2013. Molly Lefebure was a journalist who became a secretary to the Home Office pathologist Keith Simpson. In this dramatisation, Molloy Cooper (played by Tamzin Merchant) is secretary to pathologist Lennox Collins (played by Patrick Kennedy). When young women are found murdered with swastikas carved on their tongues, the police suspect a local loner but Collins and Cooper use ground-breaking forensic tests to find the real culprit. But their actions bring them up against a government fighting to keep morale high. Set during the London Blitz in the early 1940s, the show shows death can still bring its own horrors even in a city where sudden death has become commonplace. As bombs fall on London, some of its inhabitants believe they can literally get away with murder. Tamzin Merchant had her acting break in 2005 when she played Georgiana Darcy in the Oscar nominated Pride and Prejudice. Her first TV recurring role was as Catherine Howard in The Tudors from 2009 to 2010. Since then, she has played Mary Rivers in Jane Eyre, Miranda in DCI Banks and Rosa Bud in The Mystery of Edwin Drood. Patrick Kennedy is best known for playing Richard Carstone in 2005’s Bleak House, though he’d been around on television for a couple of years by then with roles such as Julian Bell in Cambridge Spies. More recent parts have included McKechnie in Parade’s End, Doctor Douglas Mason in Boardwalk Empire and Neil in Peep Show. Murder On The Home Front was produced by Christopher Hall, directed by Geoffrey Sax and executive produced by Gareth Neame and Sally Woodward Gentle. It was made for ITV by Carnival Films, a division of NBC Universal International Television Production. This sounds great! I can't wait till it comes here to the U.S. I love these types of shows.